The emergence of the digital economy has seen the gig economy balloon and skilled freelancing pools develop across diverse marketplaces. The proliferation of Internet technologies — such as peer-to-peer (P2P) networks — has vastly expanded the ability of these marketplaces to directly connect freelancers and employers. Despite the growing trend towards global cooperatives and shared digital assets, several challenges are impeding their advance. The landscape of project development is fragmented. Marketplaces lack proper market curation and monetization mechanisms. Moreover, limited access to licensed software tools has created a system with high barriers to entry and poor organizational governance. Trust-minimized systems like blockchains reduce the barriers to accessing information and enable much more efficient markets. Collaborative software development is a prime example where market inefficiencies prohibit the progression of decentralized organizations and cooperative project development. Issues such as imprecise compensation for developers of open-source projects and redundancy of functional assets for software development discourage developers from participating in projects. Moreover, universally accessible mediums for locating open-source resources and collaborating on projects are not readily available, with resources and talent tending to be scattered across several marketplaces. Fragmentation of software tool resources such as APIs and properly licensed software assets prevent developers from accessing practical tools for collaborative projects. This primarily stems from the lack of accurate market curation and incentive mechanisms for developers to provide these tools in the first place. Software licensing complexities can also inhibit the proper monetization of digital tools offered in these marketplaces, especially considering the lack of mechanisms for purchasing exceptions to the GNU GPL from open-source developers. Hierarchical payment structures and insufficient methods for sourcing talent from either solo freelancers or distributed teams further compound these limitations. Building a framework for organizing collaborative development across industries requires a transparent and adequately incentivized marketplace for resources and projects between knowledge workers, clients, and owners of proprietary software tools. Blockchain-based marketplaces provide the necessary decentralized infrastructure for automated payments and contract execution that connect users in a P2P medium. Decentralized marketplaces are widely accessible to workers from disparate industries and enable the framework for effective incentivization models. Accurate market curation can be achieved with Token Curated Registries (TCRs), reducing instances of redundancy or incompatibility in the marketplace. One of the most profound consequences of building a decentralized infrastructure for the digital economy is the ability to create novel types of organizations such as DAOs. Crowdsourced ideas can be built-out with talented pools of workers operating under agreed-upon rules of governance. Projects can be organized based on talent matching and reputation systems baked into protocols to provide a layer of transparency not available in current models. Deconet is a decentralized, Ethereum-based platform for facilitating a radically enhanced global knowledge economy. Their goal is to provide the distributed framework for a global marketplace of modular software tools and project collaboration backed by sustainable compensatory models. Deconet has a digital asset marketplace that functions as a medium for developers and organizations to buy and sell reusable software tools such as APIs and software licenses. Notably, Deconet contains its own Deconet Software License Agreement (DSLA) for bridging on-chain transactions with the legal system and subsequently allowing for a more fluid exchange of software tools. Developers can also configure assets to engage in automatic activity on the platform without necessitating the direct involvement of the owners, generating a new avenue of passive income. This provides a new ownership dynamic where autonomous transactions utilizing proprietary digital assets occur on-chain and are immutably stored on the blockchain. TCRs and their accompanying incentive mechanics have been researched extensively as tools for creating self-sustaining registries. With an accurately curated marketplace of APIs, software licenses, packages, and projects, users will have unparalleled access to resources to assist them in building better applications faster. Another component of the Deconet platform is the project market for developers to organize and collaborate on projects listed by clients that input capital in return for their services. Smart contracts on Deconet reduce trust risks and allow for automated payment dynamics of distributed teams that can organize based on skill matching. Further, these teams can create project-specific rules and guidelines in collaboration with clients. The result is a new type of flexible, decentralized organization that can evolve into fully functional DAOs by layering open-source governance tools like Aragon or DAOStack on top of the Deconet platform. The digital economy is rapidly evolving and incorporating new dynamics of governance and open marketplaces. Building the decentralized infrastructure for the emerging digital economy to thrive requires new models for collaboration among knowledge workers and exchanges for utilizing and monetizing digital assets. 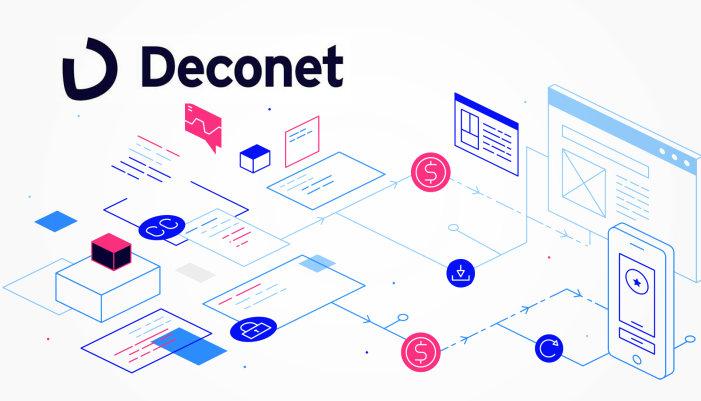 Projects like Deconet seek to provide a solution for enhancing the digital economy by creating a transparent ecosystem of cross-industry collaboration with access to modular tools.